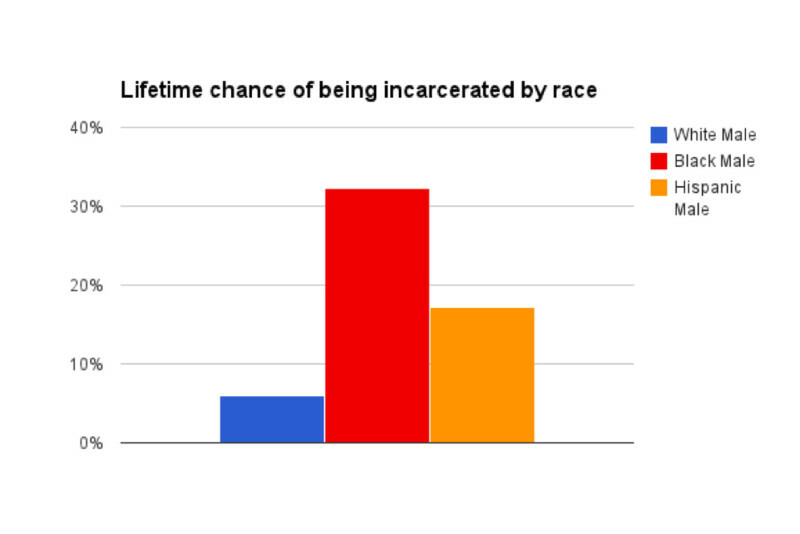 As part of a social justice assignment on incarceration rates in the United States, a student broke down the numbers by race of the liftetime odds that person will be incarcerated. Perhaps one of the most common questions teachers hear from students who struggle with math is, “When will I ever need this in the real world?” Concepts educators are covering can often feel archaic and remote from the things students care about in their immediate lives. But when educators think creatively about helping students see the applications of math in the real world, it provides a unique point of entry and interest into a subject that many kids may dislike. Teachers at the public magnet school Science Leadership Academy use a project-based inquiry model of teaching in an effort to connect all subjects to students’ lives. Examining social justice issues by the numbers has proven to be one strong way teachers can connect student passions to math. In one project, groups of three or four students were responsible for a written mathematical analysis of their topic, two visual representations of the data, an engaging public service announcement video explaining the data and a list of recommendations for how the issue could be addressed. “The biggest part of this was finding this information and saying, 'Now what do I do with it? '” said Zack, a junior at Science Leadership Academy who did this project in his sophomore year. Zack’s group examined incarceration rates in the United States, with each group member looking at an aspect of the issue, like educational attainment or geographical location of prisoners. As they each researched their own part, they kept a shared Google doc with information they were finding, sharing relevant research with one another when appropriate. One of the hardest parts of the assignment was taking research and framing it in ways that would be useful for their claims, Zack said. Without that step they couldn’t be sure they were accurately comparing different numbers. “It turns out that just five states in the South account for 20 percent of the country's total prisoners,” Zack said, a disproportionately high number for the population of that part of the country. When his research led him to that point, Zack decided to hone in on those five states to make his case. “Simplifying the information made the info more digestible and applicable,” he said. Zack’s group also found that the majority of prisoners are high school dropouts, most are living under the poverty line, and 33 percent of the nation’s black males will be incarcerated during their lifetime. The group recommended the government look at issues of bias within the criminal justice system based on this data. Demonstrating mathematical concepts, like central tendency or odds, and probability, suddenly felt very real to students. “We wanted to give students a lot of room to have choice,” said math teacher Brad Latimer of a project in his algebra II class. Students chose social justice-themed issues that interested them and then used research and data analysis to prove how the topic connected to social justice. Statistics is arguably one of the most useful math disciplines, since citizens encounter numbers proving claims everyday in the news and as justification for various political policies. That also makes studying statistics a powerful vehicle for interdisciplinary learning. 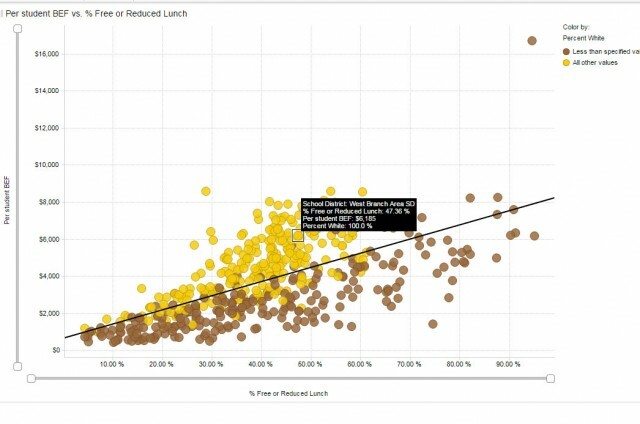 SLA’s statistics and “Science and Society” teachers teamed up to examine the differences between organic and non-organic foods, as well as their cost and prevalence in different parts of the city. Students learned about the science behind different growing methods and how they affect nutritional qualities of food in science, while doing a statistical analysis of food availability in Philadelphia. Students in groups of three to five visited grocery stores, sometimes of the same brand, in different zip codes throughout Philadelphia. No student in the class could go to the same store. “It increased our analysis because we had more data from around the city,” explained Adam, an SLA senior. They had to look for and note the prices of the organic and non-organic versions of different food items their teacher, Mark Miles, had selected. Students took selfies of themselves in the stores to prove that they’d actually gone. Each student was responsible for calculating and interpreting the 5-number summaries and IQRs, and means and standard deviations. They also had to draw and interpret box plots and histograms for all the group’s prices together, non-organic prices, organic prices and the difference between non-organic and organic prices. “Growing up in Philadelphia, there were a lot more stores with non-organic because it’s cheaper,” Adam said. He went on to note that after learning about the nutritional value of organics he felt it was unfair that poor people in his city didn't even have access to products that might improve their health. Even students who struggled in math were engaged in these social justice-oriented projects because teachers were careful to build in authentic choices that allowed students to investigate an area of interest. “A lot of kids who struggle in math don’t see the relevance or they say they don’t care about that application,” math teacher Erin Giorgio said. She found that even the kids who say they hate math grab onto these projects, and the best part is that their research leads them to ask lots of questions as they grapple with their data. There are lots of ways to make math applicable to problems in the real world, but it takes creativity on the part of teachers and students. Giorgio will sometimes ask her students to analyze attendance data in Philadelphia based on the kind of school students attend: magnet, charter or neighborhood. As they notice things like the fact that attendance is much higher at magnet schools, they start asking more questions and talk about the reasons why that trend holds true. “The end game is to get kids to recognize that math is important in their life,” Giorgio said. Other ideas might include using physics to engineer a product that helps someone else or using geometry to investigate architecture in different neighborhoods or acreage of vacant lots. The power of investigating social justice issues by the numbers lies in high school students' passion for changing the world. Adolescents are becoming aware of their place within the wider world and many want to have a positive impact on it. Understanding how math will help them do that only makes them more prepared.